This past week I had some moments (granted to me by a kindly stomach bug) to lay on the couch all day and read a book. I picked The Outcast because I have been so curious about it. Reading it in one setting was a treat and I was glad to be able to do so because it was so riveting a story that I wouldn't have wanted to walk away. The story is set in an Old Order Mennonite community and it tells of two twin sisters, Rachel and Leah. Leah has married a man named Tobias who has recently been picked as the Bishop of the small community. Upon becoming pregnant and experiencing some difficulties, Leah asks her twin sister to come and live with her and her new husband to help her through the birth of her baby. Rachel agrees to come and before too long it is discovered that she herself is with child. Rachel will not say who the father is. Depending on how much you like to predict story endings as you read through a book, you can more or less guess who the father happens to be just as you can predict who the father of Hester's baby is in The Scarlet Letter. Although this book is in part predictable, I still very much enjoyed it with one exception. Petersheim tells her story through a variety of individuals. Sometimes we are hearing of the chain of events from the perspective of Rachel and sometimes Leah. Every few chapters we are told parts of the story through the character of Tobias's dead father, Amos, the former Bishop of the community. I think it particularly odd to be told the story from the perspective of a dead man, as if he is looking down from Heaven. We don't really know, exactly, how much our dead relations are made privy to our lives and I am not so sure I particularly care for the speculation. Theologically I question Petersheim's choice. Then, too, I just find it weird. The story is easily told from the perspective of the living and my personal preference is that it had been left as such. Towards the end of the story I can see why it is that Petrsheim chose to insert a dead character into her story telling but, well, I just don't agree with her on that one. That aside, the story is very interesting. You should note, if you are interested in learning more about Plain communities, that The Outcast isn't bent on informing you about their way of life. You can catch clues as the story moves along, but sharing about Plain living is not the focal point of the book. Mostly it is a story about redemption and grace. Pretend Hester confessed her sins as some of us which she had done and that other characters responded in Hawthorne's tale had behaved in a more Biblically correct manner as called upon by their faith and you have a satisfying ending to The Scarlet Letter in Petersheim's debut novel. The Outcast is pretty much a continuation of our book club discussion in which several of us declared how we thought Hester ought to have behaved, and what we thought Dimmesdale truly deserved. The same themes present in The Scarlet Letter are also present for discussion in The Outcast . Those being? : legalism, sin, and guilt. The differences between Hawthorne and Petersheim are notable, as you might expect. In my opinion Petersheim is much more palatable because she isn't writing to slam a particular group of people, like Hawthorne did with the Puritans. In other words, I do not have the impression that Petersheim hates the Old Order Mennonites but rather just uses their community as the setting for her story. (Her story, by the way, is based on a true one which was told to her once upon a time.) However, at the same time, Hawthorne had great skill as a writer and you should absolutely not avoid Hawthorne's tale to read Petersheim's instead. That would be a great reading crime indeed! Absolutely read Hawthorne! And after you've done so, then enjoy Petersheim if you wish. Petersheim's writing style is quite palatable. I was very happy to note that she didn't try to insert God into every page as so many Christian authors do. She allows her story to communicate the truths in her message that she wants communicated (for the most part). To me, I think that allowing your story to speak truth without blatancy is a great skill that ought to be honed by more Christian authors. A solid Christian story doesn't have to insert the name of Jesus every other page just to make it religious enough to suit us. Christians who think that you can only read something that is expressly "Christian" verge on being legalistic. Also, too, they verge on having very poor taste in literature because Christian publishing houses today pretty much agree to publish anything, so long as it mentions God, regardless of writing skill. Spending a lot of time with "cheap" writing will do nothing for the development of your mind and spiritual walk. We shouldn't accept sloppy writing but should be seeking out well-told and well-crafted tales that cause us to ponder truth in new ways. It does me good to read Petersheim's book and be swept up into story for her story telling abilities. She is not clumsy in sharing her faith as so many are (until the very end, but I get the point of that and can forgive it to a certain degree). Her message was not bothersome to me at that point because of the manner in which she concluded her story, which is different from Hawthorne's story, and called for different dialogue. Yes, it was more blatant but it was also minimal so I was not put off by it in the end. All in all, I have to say that I rather liked it and wouldn't have any issues recommending it to anyone else, with the exception of Amos-the-dead-guy who I think is strange. But it's not so strange as to be entirely distracting to me and I ended up enjoying it on the whole. It proved a good diversion and some additional food for thought! I am just delighted to say that Jolina Petersheim has offered to giveaway a copy of this book to one of you! Would you care to win? Simply leave a comment below (including a valid e-mail address). This contest is open to US Residents only and will be open through Wednesday, July 24th. THIS CONTEST IS NOW CLOSED. THE WINNER (as selected by Random.org) is #5 - Wholesome Womanhood. Congratulations!! Many thanks to Tyndale House Publishers who sent a copy of this book my direction in exchange for my honest thoughts. Thanks also to Jolina Petersheim who has offered to give away a copy to one of my readers here at Reading to Know. I just came across this recently somewhere - maybe someone's What's on Your Nightstand post - and thought it sounded very interesting. I'd love to be enetered to win a copy. The view from the dead guy does sound weird. I tire of Amish books bc so many plots are similar (let alone not always accurate to their way of life). However, this does sound interesting. Personally, I agree with you about Christian publishers not being too choosy about the CONTENT they publish. I think published writers have a variety of skills...just as some secular authors are awful (according to my opinion), you'll find it in the Christian industry. I haven't read much Christian fiction in a long while, but this one sounds intriguing. I'd like to win a copy. Thank you so much for the thoughtful review, Carrie. I really, really enjoyed reading your perspective of the story! sounds like an interesting read with a unique perspective! I remember enjoying The Scarlet Letter in high school, so I'm definitely interested in this book. I would enjoy winning this one! Check out the last paragraph of this blog. It's an interesting thought, if nothing else. Oh, wouldn't this be a fun follow-up to The Scarlet Letter! I need a nice, relaxing fiction story. I would love to read this book! You've done a good job peaking my interest. The Outcast is on my "to be read" list and I would love to win a copy. Sorry you were ill, Carrie, but how nice to be able to read a whole day. That last part is certainly a treat. I hope you are all fine by now. 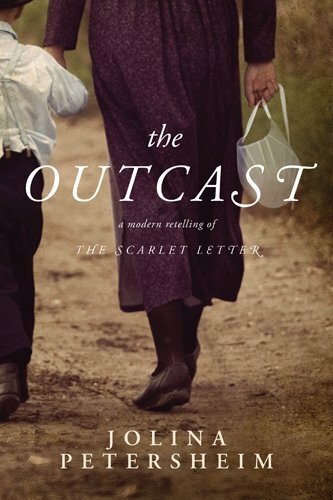 I would also like to read The Outcast and see how it compares/contrast with The Scarlet Letter. I enjoyed reading your review on this book. It definitely sounds interesting, and I would love to win it. Please enter me. Thanks! I would be interested in reading this- thanks for the giveaway!